STEPHEN, GEORGE, 1st Baron MOUNT STEPHEN, businessman, financier, and philanthropist; b. 5 June 1829 near Dufftown, Banffshire, Scotland, son of William Stephen, a carpenter, and Elspet Smith, a crofter’s daughter; m. first 8 March 1853 Annie Charlotte Kane (d. 1896) in Woolwich (London), and they had a stillborn child and adopted a daughter; m. secondly 27 Nov. 1897 Gian Tufnell (d. 1933) in Westminster (London), and they had a stillborn child; d. 29 Nov. 1921 in Brocket Hall, Hertfordshire, England. George Stephen was still an infant when his parents moved to Dufftown, in Banffshire. Educated at the parish school until age 14, he worked briefly at a local hotel and then in Aberdeen as an apprentice to a silk merchant. In 1847 his father and sister immigrated to Montreal. The following year Stephen moved to London, where he worked for a dry goods firm; the remainder of his immediate family went to Montreal. Stephen followed in 1850, after having secured employment with his cousin William Stephen, an importer of dry goods. Within several years Stephen had become the firm’s chief buyer. After the death of his cousin in 1862, he took over the business with his youngest brother, Francis. 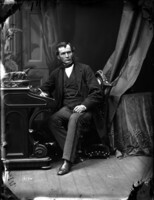 The rapid advance of his career was shown by his election to the Montreal Board of Trade in July 1864. Three years later he sold the dry goods firm to Francis and his partner, Andrew Robertson*. In 1866 Stephen had established a new firm, George Stephen and Company, which concentrated on the sale and manufacture of woollens and other cloths. He would also act as an agent for textile manufacturers. That year he provided financing to Bennett Rosamond* and his brother William for their tweed mills in Almonte, Upper Canada, and he would be among the incorporators of the Almonte Knitting Company in 1882. By 1866 he had met his cousin Donald Alexander Smith*, a chief factor in the Hudson’s Bay Company. The two were to become partners in a myriad of businesses and their careers and fortunes would be closely allied. One of their first investments, in 1868, was the Paton Manufacturing Company of Sherbrooke, a woollen mill built by Andrew Paton*. In 1890 the same partners would acquire the Quebec Worsted Company and, later, a Sherbrooke mill from the firm of Adam Lomas and Son. By the late 1860s and early 1870s Stephen had become one of the foremost financiers in Montreal. In May 1869 he initiated the recapitalization of the Montreal Rolling Mills Company, a manufacturer of nails and iron bars. He formed a board composed of notables such as Hugh Allan*, Charles John Brydges*, and Edwin Henry King*. The firm would become a leading manufacturer in Saint-Henri (Montreal). A partner in the Sun Mutual Life Insurance Company of Montreal at its incorporation in 1871 [see Mathew Hamilton Gault*], the following year he created the Canada Cotton Manufacturing Company, joining Allan, Smith, Bennett Rosamond, Donald McInnes*, and others in building mills in Cornwall, Ont. In 1870 Stephen had begun to take an interest in railways, forming the Canada Rolling Stock Company. Smith's convincing tales of the promise of the Canadian northwest encouraged Stephen to attach his name in 1871 and 1873 to two proposals to build lines to Fort Garry (Winnipeg). Although these projects never materialized, his involvement dispels the fable, later circulated by railway executive Sir William Cornelius Van Horne*, that his interest in western railways had been the result of a chance trip from Chicago to St Paul, Minn., in the late 1870s. 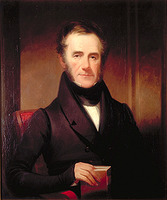 A director of the Bank of Montreal since 1871 and vice-president from 1873, Stephen was named president in March 1876. His presidency coincided with a period of economic depression. Nonetheless, the bank maintained its position as Canada’s principal consumer and investment bank. Stephen’s role was partly ceremonial and partly political, but he was often called on to take an active part in the bank’s affairs, travelling to London and New York to meet with leading financiers. Although he was initially apolitical, Stephen occasionally spoke at public meetings or issued trenchant statements on economic issues. 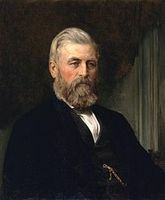 Ostensibly a free trader, as the economic depression of the 1870s deepened he became an advocate of higher tariffs for certain products and of duty exemptions for specialized equipment, such as that used in textile manufacturing or railway construction. By the late 1870s he was increasingly seen as an ally of the Conservatives. After Sir John A. Macdonald* was re-elected prime minister in 1878, textile and rolling mills were among the industries that received favourable treatment under the National Policy. As was the case with other businessmen of his age, Stephen’s politics closely followed his economic interests. In 1877 Smith had introduced Stephen to James Jerome Hill*, a businessman who ran steamboats on the Red River. In August, Stephen visited the unfinished line of the St Paul and Pacific Railroad in Minnesota that Hill sought to purchase and complete to the Canadian border; he was inspired by the prospects. Their meeting led to the establishment of George Stephen and Associates, one of the most profitable partnerships in the history of North American railways. Stephen, Smith, and Hill were joined by Hill’s steamboat partner, Norman Wolfred Kittson*. An essential but invisible associate was John Stewart Kennedy, a New York investment banker. The following year Stephen and his partners purchased the line for $5,500,000 in cash and bonds. Unable to obtain financing from London investment banks, Stephen and Smith pledged cash and collateral for their shares, securing short-term financing from the Bank of Montreal. The railway was renamed the St Paul, Minneapolis and Manitoba Railroad, with Stephen as president. In Montreal’s financial community the audacious deal was controversial. 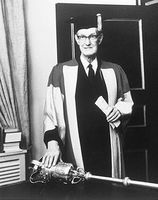 It was widely rumoured that Stephen had used his position as president of the Bank of Montreal to obtain loans at preferred rates and with limited collateral. The profits that the company reaped even before the link was established to Winnipeg in December 1878 fuelled these rumours. Stephen’s railway enterprises were to be dogged by the press, which closely examined the complicated financial structures for which he would become renowned. He would treat the “scribblers” with contempt, but worried incessantly about their effect on his businesses and reputation. In the summer of 1880 Stephen began negotiations to secure the contract to build the Canadian Pacific Railway. 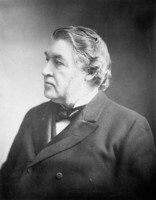 Using Duncan McIntyre* of the Canada Central Railway as his frontman, he sparred with Macdonald and his minister of railways and canals, Sir Charles Tupper*, over the terms. The final agreement provided the CPR with $25,000,000 in cash, 25,000,000 acres of land west of Winnipeg, and 713 miles of finished railway. The CPR was given tax exemptions, relief on duties for building materials, and a 20-year monopoly prohibiting the construction of railways south of its line in western Canada. When the contract was signed in Ottawa on 21 Oct. 1880, the syndicate comprised Richard Bladworth Angus, Stephen, McIntyre, and Hill, as well as Kennedy. Representatives of Morton, Rose and Company, the investment bank led by former finance minister Sir John Rose*, and of Kohn-Reinach et Compagnie, a Franco-German banking house, were also involved. 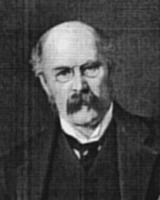 Smith, who had earned Macdonald’s animosity, was left off the list, but he would be a substantial shareholder and a valuable assistant to Stephen. The CPR was incorporated on 16 Feb. 1881, with Stephen as president. He immediately resigned from the board of the Bank of Montreal to dedicate himself to the railway. 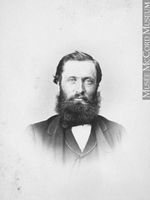 Stephen miscalculated the time and effort the CPR would require; by November 1881 he admitted it was “assuming dimensions far beyond my calculations.” He withdrew from the daily management of the Manitoba line and recalled its vice-president, Angus, to Montreal to assist him with CPR matters. 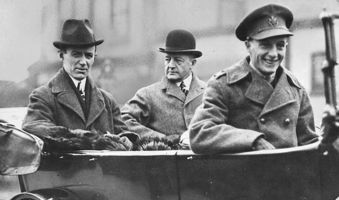 At Hill’s suggestion, he hired Van Horne to manage the construction of three major sections. But Hill was unable to persuade the syndicate to abandon the Lake Superior route, which he correctly forecast would be a drag on the CPR in addition to being in direct competition with the Manitoba railway. The task Stephen faced, of finding additional financing, proved to be as difficult as that of building across 2,000 miles of forest, swamp, rivers, and mountains. The total cost was estimated at $100,000,000, of which at least half had to be secured. Stephen proposed to finance the CPR largely by limiting its ownership to “the smallest possible point,” by raising money from a select group of investors, and by providing investors with returns relative to the railway’s performance. In so doing, he adopted the model used on the Manitoba line, in which the company would have sufficient funds to reinvest in its line and rolling stock, thereby lowering its operating expenses and building share value. Short-term financing was to be provided by the government grant paid on the completion of each mile of track as well by the revenue from land sales. Stephen’s plan was to pattern land settlement along the route, based on the experience of the Manitoba railway, where waves of immigrants had provided the road with passengers and generated freight traffic almost immediately. Both strategies proved to be optimistic. The location of the CPR became the object of speculation, driving land prices to unreasonable levels. Immigrants were not immediately attracted to the prairies, whose fertility had long been the subject of debate. Stephen’s schemes to entice settlers from Scotland and Ireland did not get support from the British government, and the HBC, which owned large tracts of land, proved to be a recalcitrant partner in the settlement of the west. Driven by the need for revenues and an eastern terminus beyond the designated end of the CPR at Callander, near North Bay, Ont., Stephen dedicated much of his time to the acquisition and construction of regional lines in Ontario and Quebec. The syndicate bought the Canada Central in 1881, the western section of the Quebec, Montreal, Ottawa and Occidental in 1882, and the Toronto, Grey and Bruce in 1884. To connect Ottawa to Toronto, it built the Ontario and Quebec Railway. Stephen had personally acquired a large interest in the Credit Valley Railway from George Laidlaw* in 1880 and later incorporated the line into the CPR network. The rapid expansion of the CPR into the territory controlled by the Grand Trunk, under Joseph Hickson*, led to conflict between the two in the 1880s. Under pressure from Macdonald, the CPR and the Grand Trunk put an end to their territorial battles in 1890. Although Stephen showed considerable tactical skill in creating an eastern network for the CPR, the capital it had required put increasing demands on the syndicate’s financial resources. By 1883 the syndicate was showing signs of strain. The CPR had found few investors in the capital markets of London and New York, so Stephen had to borrow against his Manitoba stock and pledge his new Montreal mansion as collateral. Finally he and Smith sold some of their shares in the Manitoba railway in order to meet the CPR’s expenses and dividend payments. Hill refused to do the same for fear of losing majority control of the line. He had come to the realization that the CPR would compete fiercely with his own railway for eastbound traffic. He resigned from the CPR board in May 1883, but held on to half of his shares out of loyalty to his partners. Kennedy also left, depressing the CPR stock yet further and making Stephen’s increasingly frantic attempts to find capital more difficult. 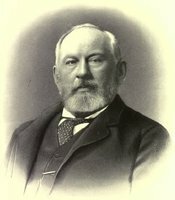 In the face of the looming crisis, McIntyre resigned in May 1884 and soon after forced the other directors to buy his shares, earning Stephen’s lifelong enmity. 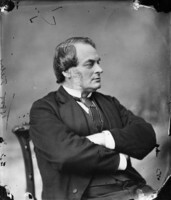 Stephen had successfully lobbied Macdonald for a bill to guarantee the CPR’s dividend payments, due in November 1884, and pay other expenses; the legislation had passed in March. By the beginning of 1885, Stephen, Smith, and Angus had exhausted their collateral. They used the exposure of the Bank of Montreal to the CPR and the threat to the security of the banking system generally as the pretext for a second relief bill. Tupper and mp John Henry Pope* argued convincingly in cabinet in support of the measure. 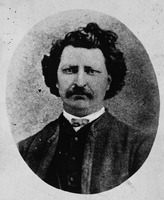 The outbreak of the North-West rebellion [see Louis Riel*] in March 1885 provided ample evidence of the value of a transcontinental link; troops were transported in seven days where it had taken four months in 1870 at the time of the Red River uprising. This situation eased passage of the bill, assented to on 20 July 1885, which provided for a new bond issue that brought the railway enough money to stave off its creditors and complete construction. Stephen was absent when Smith pounded home the last spike at Craigellachie, B.C., on 7 Nov. 1885. Whether they had held on out of obstinacy, recklessness, or pride, Stephen, Smith, and Angus were the sole members of the original syndicate to have stayed. 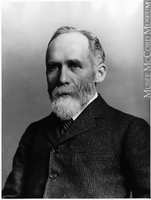 The support of Macdonald and his cabinet had proved essential and had provided a counterweight to the CPR’s shaky financial foundations. Yet Stephen refused to accept the argument that the CPR owed its existence to the government. He dismissed any attempts to impinge on the railway’s freedom and became embroiled in a very public battle of several years’ duration with the Manitoba government of Premier John Norquay* over the unpopular monopoly clause. Bowing to public pressure in 1888, the CPR allowed for the construction of branch lines south of its main line, but it wrestled a compensatory payment from the federal government. On this and other issues, Stephen proved himself ill-suited to public debate, his threats and condemnations serving only to fan the flames of discontent. 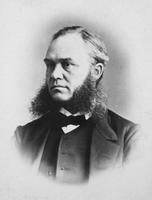 He resigned from the CPR’s presidency on 7 Aug. 1888, supporting the appointment of Van Horne as his replacement. 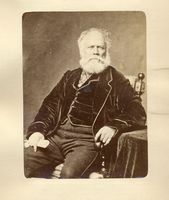 He remained a director until 1893, but thereafter showed only sporadic interest in the railway; he reduced his holdings substantially and even encouraged others to follow suit. As the CPR’s first president, Stephen had played politicians ably and his indefatigable pleading had proved effective. He also deployed an extensive network of allies, whom he secured by various means. For instance, Pope, the influential minister, was offered advantageous options on stock in the New Brunswick Railway (also acquired by the CPR). When Hugh John Macdonald, son of the prime minister, announced his move to Winnipeg to open a law office with a son of Tupper, Stephen immediately offered $5,000 of legal business from the CPR’s land department. The extent to which Stephen had acquired the allegiance of Macdonald and his government is hinted at in a letter he wrote to the prime minister in 1890 in which he mentioned that he had personally contributed more than $1,000,000 to the Conservative party since 1882. If Stephen rued his involvement in the CPR, it was largely because of the toll it took on his own portfolio. His liquidation of a substantial portion of his stake in the Manitoba railway to finance the CPR made him a poorer man than Hill. He also regretted having encouraged his associates to invest in the CPR, knowing that the Manitoba railway was a better opportunity. 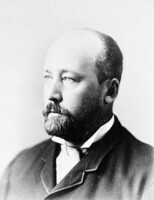 Although he had resigned the presidency of the Manitoba board in February 1884, he nurtured lifelong affection for his first railway venture and for its enterprising president. Hill developed the St Paul, Minneapolis and Manitoba line into the Great Northern Railroad and built his own transcontinental network. It remained Stephen’s principal investment and the source of most of his wealth. In key moments in the expansion of Hill’s empire Stephen would prove to be his staunchest ally. During the mid 1880s Stephen spent more and more time in England. By 1888 he was domiciled there. He had garnered the first of many honours when he was made a baronet on 3 March 1886. In 1891 he was granted a peerage and took the title Baron Mount Stephen from a peak in the Rocky Mountains adjacent to the CPR line. Although he sat regularly in the House of Lords, he never took part in debates or committees. He returned to Canada infrequently, making his last trip in 1894. 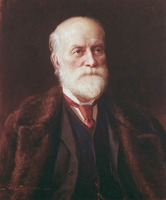 His support was nonetheless sought by those pursuing higher office in Canada, such as Lord Minto [Elliot*], who acknowledged that he owed his appointment as governor general in 1898 to the influence of Stephen and Garnet Joseph, Lord Wolseley*. 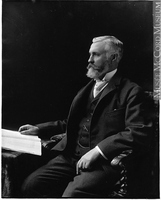 From the 1890s onwards, Stephen delegated management of most of his investments in Canada to his brother-in-law Robert Meighen* and his private affairs to his Canadian agent, John Turnbull. His American affairs he left in the hands of lawyer John William Sterling. 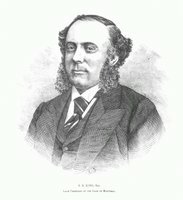 His English investments were managed by Gaspard Farrer, a partner in Baring Brothers. In private life Stephen was retiring. He and his first wife had adopted as a young woman Alice Brooke, purportedly the daughter of a Vermont clergyman. 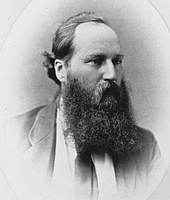 Stephen would introduce her to her husband, Henry Stafford Northcote, and would help him secure the position of governor of Bombay. His second wife, Gian Tufnell, 35 years his junior, had been lady-in-waiting to the Duchess of Teck and was a close friend of her daughter, who would become Queen Mary in 1910. The Stephens regularly hosted members of the royal family at Brocket Hall in Hertfordshire, a substantial home with extensive gardens, which they leased from 1893. A tireless worker, Stephen had only one pastime, salmon fishing. In November 1873 he had bought property at the confluence of the Causapscal and Matapédia rivers in Quebec and acquired leases on fishing rights. He made regular trips there and entertained business partners, friends, and the occasional governor general. A pioneer of sport fishing in the Gaspé peninsula, he introduced many to the sport and to the region, where he became a benefactor. By the 1880s he was seeking other waters to fish. In 1886 he purchased land in Grand-Métis. On a promontory overlooking the Mitis and St Lawrence rivers he built Estevan Lodge. The house, property, and contents cost $73,426. In 1918 he would give the estate to his niece Elsie Reford [Meighen*], who would later transform it into a vast ornamental garden. In 1883 Stephen had moved into the mansion he built in Montreal. Designed by William Tutin Thomas, the house cost some $600,000. It has been described by architectural historian Arthur John Hampson Richardson as a “one of the real masterpieces of the [Italianate] style in Canada.” After Stephen moved to England, the residence was used by his sister Elsie and her husband, Robert Meighen, who acquired it in 1900. It would become the Mount Stephen Club in 1926. One of the most generous philanthropists of his time, Stephen sought no accolades for his gestures. Although he made ample provision for his 19 nieces and nephews and the relatives of his two wives, he directed much of his wealth towards hospitals. In 1890 he and Smith had acquired the Frothingham estate [see John Frothingham*] in Montreal as the site for the Royal Victoria Hospital and they contributed $500,000 each to its construction. After it opened in 1893, they gave an additional $500,000 each in stock to pay for the building and establish an endowment fund. Stephen also donated a wing to the Montreal General Hospital and made donations to hospitals in Scotland, but he reserved the bulk of his wealth for a single charity, the Prince of Wales Hospital Fund for London (renamed King Edward’s Hospital Fund in 1907). Established in 1897, it assisted the voluntary hospitals in the greater London area. Stephen worked closely with the Prince of Wales (later George V) in building the endowment and was its most important benefactor. His total gifts to it amounted to £1,315,000. Almost completely deaf in his later years, Stephen spent much of his time at Brocket Hall and showed a firm hand and mind until shortly before his death in 1921. He was buried in the graveyard nearby. Although he had given generously to hospitals, it was not because he had had occasion to use them. Blessed with a solid constitution, he had enjoyed remarkable health, not missing a day to illness in over 53 years and never suffering a single headache. At the time of his death, his estate was valued at £1,414,319. He left little to charities or causes in Canada, believing that he had given more to this country than it had given to him. Unlike his partners and associates Hill, Smith, and Van Horne, Stephen was never accorded a biography by contemporary publicists or authors. The fact that he burned the bulk of his papers before his death and had no children helped to make his story inaccessible. His quiet retirement to England at age 59 had removed him from public attention and the dizzying complexity of his financial transactions made him a less appealing subject than his larger-than-life partners. In addition, his reputation has risen and fallen with that of the CPR. Critics have viewed the railway as a needless extravagance, nationalists have seen it as essential to the creation of a transcontinental nation. Stephen himself was ambivalent. However important he believed the CPR to be to Canada, he was not convinced of its value as a business investment. His withdrawal from it is sometimes interpreted as a slight to Canada and a petulant retreat from a country that had not adequately acknowledged his importance. In fact, he received the highest honour then awarded to a Canadian, a peerage. His rapid withdrawal underscores that he fully comprehended the nature of railroading, where profitability depended more on competent managers than ambitious financiers. In Hill and Van Horne, he was associated with two of the best on the continent. James Jerome Hill Reference Library (St Paul, Minn.), J. J. Hill papers (mfm. at LAC). LAC, MG 26, A; MG 29, A28, A30; MG 30, D59, 18. Private arch., Alexander Reford (Grand-Métis, Qué. ), George Stephen, 1st Baron Mount Stephen, letter-book. Gazette (Montreal), 19-20 Aug. 1879. Globe, 12 Sept. 1883. Times (London), 1 Dec. 1921. Michael Bliss, Northern enterprise: five centuries of Canadian business (Toronto, 1987). C. J. Brydges, The letters of Charles John Brydges, 1883-1889; Hudson’s Bay Company land commissioner, ed. Hartwell Bowsfield, intro. J. E. Rea (Winnipeg, 1981). Canada Gazette, 16 Dec. 1871. D. [G.] Creighton, John A. Macdonald, the old chieftain (Toronto, 1955; repr. 1965). Merrill Denison, Canada’s first bank: a history of the Bank of Montreal (2v., Toronto and Montreal, 1966-67). Dominion annual reg., 1879-81, 1885-86. J. A. Eagle, The Canadian Pacific Railway and the development of western Canada, 1896-1914 (Kingston, Ont., 1989). Ben Forster, A conjunction of interests: business, politics, and tariffs, 1825-1879 (Toronto, 1986). Heather Gilbert, “A footnote to history: the unaccountable fifth; solution of a Great Northern enigma,” Minn. Hist. (St Paul), 42 (1971): 175-77; The life of Lord Mount Stephen . . . (2v., Aberdeen, Scot., 1965-77); “Mount Stephen: a study in environments,” Northern Scotland (Aberdeen), 1 (1972), no.2: 177-97. R. D. Lewis, Manufacturing Montreal: the making of an industrial landscape, 1850 to 1930 (Baltimore, Md, 2000). London Gazette, 26 June 1891. Donna McDonald, Lord Strathcona: a biography of Donald Alexander Smith (Toronto and Oxford, 1996). Albro Martin, James J. Hill and the opening of the northwest (New York, 1976; repr., intro. W. T. White, St Paul, 1991). Keith Morris, The story of Lord Mount Stephen (London, 1922). A. A. den Otter, “The Hudson’s Bay Company’s prairie transportation problem, 1870-85,” in The developing west: essays on Canadian history in honor of Lewis H. Thomas, ed. J. E. Foster (Edmonton, 1983), 25-47; “Transportation and transformation, the Hudson’s Bay Company, 1857-1885,” Great Plains Quarterly (Lincoln, Nebr. ), 3 (1983): 171-85. James Pope-Hennessy, Queen Mary, 1867-1953 (London, ). A. J. H. Richardson et al., Quebec City: architects, artisans and builders (Ottawa, 1984). Types of Canadian women . . . , ed. H. J. Morgan (Toronto, 1903). B. J. Young, Promoters and politicians: the north-shore railways in the history of Quebec, 1854-85 (Toronto, 1978). Alexander Reford, “STEPHEN, GEORGE, 1st Baron MOUNT STEPHEN,” in Dictionary of Canadian Biography, vol. 15, University of Toronto/Université Laval, 2003–, accessed April 24, 2019, http://www.biographi.ca/en/bio/stephen_george_15E.html.